Every new mother’s body reacts in different ways once the baby has been born and during the years of raising children. Some people see their bodies naturally return to form; however, for many women, even the strictest diet and exercise regimens have little effect on ridding the tummy, thighs, hips, and other areas from excess fat and loose skin. As part of a Mommy Makeover procedure, Dr. Thomas Lintner can talk with you about many options designed to reverse these effects. Liposuction, tummy tuck surgery, and other treatments can go a long way in restoring your post-baby body to its pre-pregnancy physique. Please take a look at the following conditions and learn more about effective treatment options that can address them. 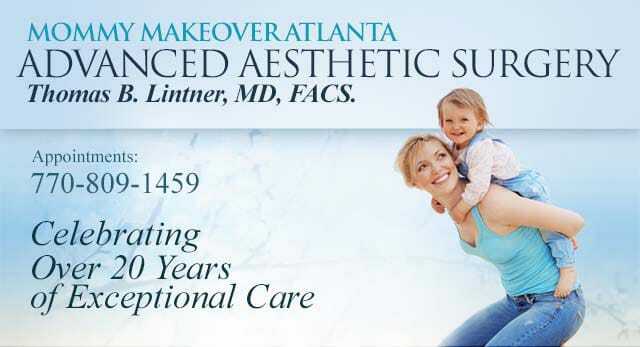 Contact Advanced Aesthetic Surgery to schedule a consultation, and Dr. Lintner will be happy to meet with you to discuss all aspects of treatment. The most obvious area of physical change after pregnancy is the stomach region. During pregnancy, the abdominal muscles are stretched and often pulled apart. This effect, especially when combined with excess fat and skin that has accumulated in the area, can make it very difficult to get the tummy back into pre-pregnancy shape through diet and exercise alone. A tummy tuck (abdominoplasty) is designed to tighten the abdominal muscles, eliminate excess skin, and smooth out the remainder for a flatter-looking stomach. If you have relatively good skin tone, but an accumulation of excess fat in specific areas after pregnancy, liposuction may be a great option to include in a Mommy Makeover. This popular procedure can be performed on virtually any body region and can eliminate stubborn fat pockets that have proven resistant to diet and exercise.